Republicans have seized on Mr. Estrada's stalled nomination to drive a wedge between the Democratic Party and Hispanic voters, whose ranks are growing faster than any other minority group in America. "I see this, really, as a slap at Hispanics," Sen. Jon Kyl, Arizona Republican, said Wednesday. Washington Times, March 14, 2003. Isn't NEXIS wonderful? This is strictly about whether or not a minority of senators is going to prevent the president from being able to name and get confirmed judges that he chooses after he's been elected by the American people. And it's never been the case until the last two years that a minority could dictate to the majority what they could do." [NewsHour with Jim Lehrer, Judicial Wars, 4/25/05]. Arizona Sen. Jon Kyl on Sunday refused to rule out a filibuster if President Barack Obama seeks a Supreme Court justice who decides cases based on "emotions or feelings or preconceived ideas." The Senate's No. 2 Republican made clear he would use the procedure if Obama follows through on his pledge to nominate someone who takes into account human suffering and employs "empathy" from the bench. Kyl acknowledged that his party likely does not have enough votes to sustain a filibuster, but he said nonetheless he would try to delay or derail the nomination if Obama ventures outside the "mainstream." It makes sense once you realize that instead of the Constitution, what Senator Kyl wishes to preserve, protect, and defend is the Republican Party of the United States. After all, wasn't that the holding of Marbury v. Madison, that it's OK if you're a Republican? Or was it "two wrongs make a right?" I can't remember, 2005 was so long ago. Which isn't quite so little anymore. Here's our updated announcement of our recent comings and going. The original appeared in the Arizona Attorney magazine, but the deadline for the ad was too soon to include our newest arrival, Naomi Jorgensen. People here were a bit freaked initially over Andy's departure but from what I can see, the net result is that as a firm, we're younger, smarter, and better looking. In the hope that this humble blog will become a must-visit destination for readers interested in both politics and resolving real estate boundary disputes short of litigation, click here or here for information about the continuing legal education seminar that I am presenting with Scott Malm of Gust Rosenfeld P.L.C. and John Stock, PLS, USMS, CFM, of the Maricopa County Flood Control District on June 9th entitled "Boundary Disputes: Resolving Conflicts Without Going to Court." We hope it's "Must-See CLE." Results from Sunday's Tempe International Triathlon are available here (scroll down for the Men 50-54 results.) (UPDATE: Photos!) It was a good swim, a barely OK (at best) bike, and a very long, very slow, and very hot run. I had hoped to break 3 hours but straggled home in 3:09:43 (378/540 overall, age group 20/27.) But my one point for finishing helped my team (Go Ungainly Named Tri-Scottsdale/Gage Racing Triathlon Club!) win the state team championship. (Now maybe the emails will stop.) But if I can get my run time down to a far less embarrassing 59 minutes, show more speed on the bike, and work on my transitions, I should be able to break 3:00 in NYC in July. I hope. No wetsuits, the water was too warm. Too bad, as it's hard not to look cool in a wetsuit. 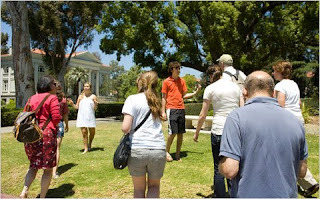 Our son (in orange shirt) leads a tour at Pomona College, courtesy of NYTimes.com. Are now Ben and Louis.